Diagram of the STAIR (St Andrews Air) cell. 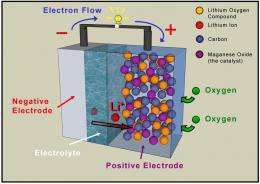 Oxygen drawn from the air reacts within the porous carbon to release the electrical charge in this lithium-air battery. A new type of air-fuelled battery could give up to ten times the energy storage of designs currently available. This step-change in capacity could pave the way for a new generation of electric cars, mobile phones and laptops. The research work, funded by the Engineering and Physical Sciences Research Council (EPSRC), is being led by researchers at the University of St Andrews with partners at Strathclyde and Newcastle. The new design has the potential to improve the performance of portable electronic products and give a major boost to the renewable energy industry. The batteries will enable a constant electrical output from sources such as wind or solar, which stop generating when the weather changes or night falls. Improved capacity is thanks to the addition of a component that uses oxygen drawn from the air during discharge, replacing one chemical constituent used in rechargeable batteries today. Not having to carry the chemicals around in the battery offers more energy for the same size battery. Reducing the size and weight of batteries with the necessary charge capacity has been a long-running battle for developers of electric cars. The STAIR (St Andrews Air) cell should be cheaper than today's rechargeables too. The new component is made of porous carbon, which is far less expensive than the lithium cobalt oxide it replaces. This four-year research project, which reaches its halfway mark in July, builds on the discovery at the university that the carbon component's interaction with air can be repeated, creating a cycle of charge and discharge. Subsequent work has more than tripled the capacity to store charge in the STAIR cell. Principal investigator on the project, Professor Peter Bruce of the Chemistry Department at the University of St Andrews, says: "Our target is to get a five to ten fold increase in storage capacity, which is beyond the horizon of current lithium batteries. Our results so far are very encouraging and have far exceeded our expectations." "The key is to use oxygen in the air as a re-agent, rather than carry the necessary chemicals around inside the battery," says Bruce. The oxygen, which will be drawn in through a surface of the battery exposed to air, reacts within the pores of the carbon to discharge the battery. "Not only is this part of the process free, the carbon component is much cheaper than current technology," says Bruce. He estimates that it will be at least five years before the STAIR cell is commercially available. Too bad the article didn't include metrics on the battery. Without the numbers you only get half the story. "at least five years before the battery is commercially available" . . . guess they have to milk the grants system for all it's worth before they let us peasants in on the technology, huh? I bet that if they knew our technological society would break down in a year if they didn't get it on the market, they'd have that thing on the shelves in 6 months or less! Since this battery draws in oxygen from the air, will not the battery get substantially heavier by the time it needs recharging? It may be lighter than ordinary batteries at the start, but by the end you will be carrying around a lot of oxides. And if the battery simply releases carbon monoxide/dioxide into the air, the porous carbon will get used up quickly. Naively we go off into the land of the world that is not truly real. R&D has more to do then just theory! It also has to do with practicality and oh yea Lawyers!! If they rush this to the market and let say Motorola puts it in your cell phone that is in your pocket, and then like a number of batteries in laptops it starts on fire you get seriously injured and they get sued. R&D works give it time!!! The question I have is if it takes in oxygen what does it out gas? Since this battery draws in oxygen from the air, will not the battery get substantially heavier by the time it needs recharging? Its air. How heavy do you think it can be? cobalt oxide? 6.11 g per cubic centimeter. @real, should off gas O2 that it oxidized in the run down process when it is recharging. If the Carbon is a consumable then it's not really rechargable. Exploding cell phone batteries have killed people(I think every single one of those cases have involved having the phone in your breast pocket, next to your heart though). Oxygen is 2.5 times heavier than lithium. Now, most of this battery is not lithium and lithium will absorb oxygen in a 50% ratio, so it's not going to be anywhere that dramatic. But if you were to take lithium metal and set fire to it, the lithium oxides would be 1.2 times heavier than the lithium metal and after absorbing water from the air the lithium hydroxide would be 2.6 times heavier than lithium metal. We have had metal air batteries/fuel cells which is what they really are for decades. Since Alum or Zinc/air are cheaper it's not a big deal. They are recharged by replacing the racks of metal grids. And yes the military uses them and have for decades. As "jerryd" comments, we have had metal-air batteries for decades. At ECL in England in the 1960's, we manufactured Zinc/Air batteries for the military. We also researched on Iron/Air. Others have worked on Aluminum/Air. Miniature Zn/Air batteries have been used in hearing aids for many years. The "air electrode" has been the cathode in H2/O2(air) fuel cells since the 1960's. I must take exception to the term "air-fuelled." The "fuel" is the material oxidized at the anode. The cathode reaction is oxidation. "Air-fueled" is a contradiction. One possible drawback is that performance may be affected by the weather. I notice a drop in output from my hearing aid batteries when a low pressure system goes through (at an altitude of 300 meters) or when I go up into the mountains, especially if the battery is nearly discharged. Call it a carbon-lithium battery. There was an air-cell battery (several in fact) here in Australia in the 1920s, and probably all over, which was a carbon-zinc cell, with porous carbon anode, caustic soda (sodium hydroxide) electrolyte, and no depolariser. The carbon allowed free (slow) access of oxygen from the atmosphere. It was designed to supply valve/tube filaments (typically 2V) in coffin radios. Two cells were required (about 2.4V to 2.8V) and a rheostat to cut down the voltage. The cell was about a 6 inch (150mm) glass cube, and probably delivered up to 0.5A continuously. It could deliver more for short bursts, but you then had to wait for it to depolarise (disperse generated gas bubbles), before reusing. You added fresh electrolyte and new zinc as needed. "Call it a carbon-lithium battery." Not so! The cell has to be named after the reactants, in this case "lithium-oxygen." Lithium is oxidised at the anode, oxygen is reduced at the cathode. The carbon electrode is merely the conductor and support for a catalyst (not stated here, but probably silver or platinum), that allows the oxygen gas to react. The carbon remains unchanged. "The cathode reaction is oxidation."